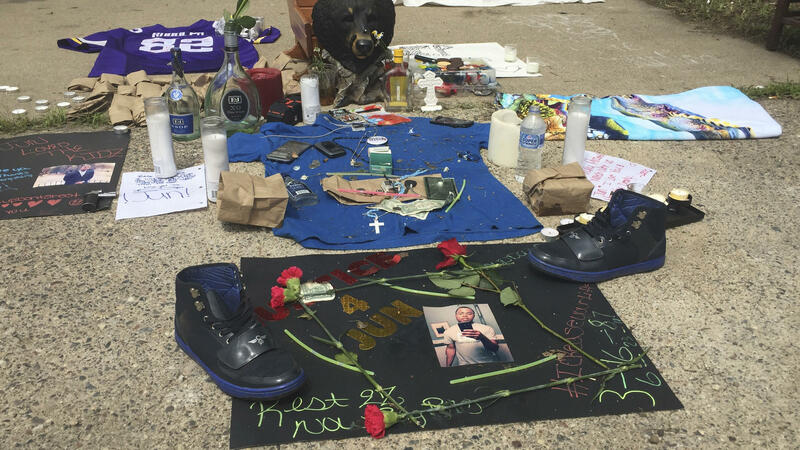 A memorial for Thomas Blevins Jr. was set up on June 25 in the alley where he was shot and killed two days earlier by Minneapolis police. On Monday, the district attorney announced he would not be charging the officers in Blevins' death. Police officers involved in a shooting that left a 31-year-old Minneapolis man dead on June 23 won't face charges, the district attorney announced on Monday. In a statement, Hennepin County Attorney Mike Freeman said that the victim, Thurman Blevins Jr., posed a threat to officers Justin Schmidt and Ryan Kelly, who shot him in an alley last month after responding to a report of a drunk man walking around and shooting a gun into the air. "When Mr. Blevins fled from the officers with a loaded handgun, refused to follow their commands for him to stop and show his hands and then took the gun out of his pocket and turned toward the officers, Mr. Blevins represented a danger to the lives of Officer Schmidt and Officer Kelly," Freeman said in the statement. "Their decision to use deadly force against Mr. Blevins under those circumstances was authorized by Minn. Stat. § 609.066 and as such there is no basis to issue criminal charges against either officer." Police body cam video released Sunday show there was about 40 seconds between when the officers reported seeing Blevins with a gun and when shots were fired, according to Minnesota Public Radio. Protests followed Blevins' death and on Monday, Freeman was interrupted by family members and activists before he could read his statement. Blevins' cousin Sydnee Brown said she wanted the officers arrested within 48 hours or there would be consequences. "We can tell that the gun was fired three times. I cannot tell you that there is sufficient proof that he, in fact, lined it up and shot at the officers." But, Freeman said, one of the officers returned fire because he thought Blevins had fired at them. Minneapolis has had other high-profile police shootings in recent years, including Philando Castile, Justine Ruszczyk and Jamar Clark.